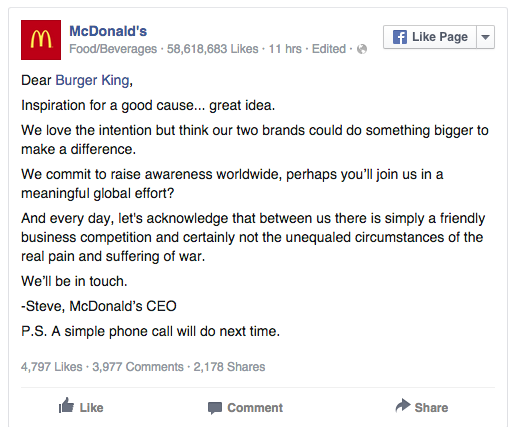 Burger King’s collaboration pitch to McDonald’s may have been flat out rejected by its competitor, but it looks like Burger King may have dominated the social media conversation following the stunt. According to social media tracking firm Spredfast, Burger King has been mentioned in social media conversation 42 per cent more than McDonald’s. As reported in B&T, Burger King ran full-page ads in The New York Times and Chicago Tribune proposing a mashup between the competitors to celebrate International Peace Day. The McWhopper would be a Frankenstein creation of the McDonald’s Big Mac and Burger King’s Whopper burger. Social media went a little nuts for the proposed collaboration. According to Spredfast, Burger King was mentioned 39,448 times while McDonald’s was mentioned 22,816 times. The hashtag ‘#McWhopperProposal’ was used 9,198 times with ‘#McWhopper’ in second with 8,341 mentions and ‘#SettletheBeef’ in third with 2,882. It looks like Macca’s might have won the battle, but Burger King won the war.